The Challenge begins Monday – March 18 @ Noon ESDT and runs through Friday, April 12. To become a Supporter make sure to message every single one of your friends, family, teachers, co-workers and other favorite people to ask them to give to your PAST Foundation – Nourish fundraiser. Use email first and foremost but also post a link to your fundraising page on social media. We are so excited and out to raise the most and get that $100,000 donation so thank you so much…your support means the world to us. You can also donate directly to the campaign if you would like. As little as $10 makes a huge difference! The food industry is in a constant state of innovation. Culinary professionals are constantly pushing to discover a new method, a new ingredient, a new source, a new presentation, a new experience. Food is, by definition, innovation at its most flavorful. The U.S. Bureau of Labor and Statistics projects demand for select culinary professions to grow 10% over the next 10 years; faster than the average for all occupations (www.bls.gov). Beyond white tablecloth dining, the challenges of diversified food sources, food related health impact, and food equality will drive the same creative entrepreneurialism that is sweeping across the energy and transportation industries today. Food is not only a universal human need it is an industry. 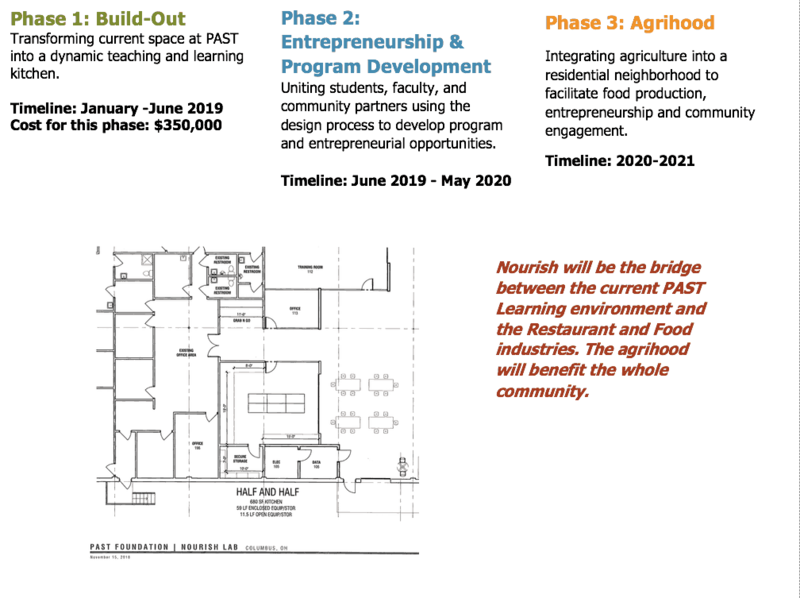 Community investment in Nourish will feed the downstream demand in established and emerging culinary programs across the country including Columbus State Community College’s Culinary Apprenticeship program, Culinary Institute of America, and the International Culinary Center. Food is innovation and innovation begins with educating future generations of culinary professionals to provide new delicacies and new solutions to the evolving landscape of food. Nourish will have three distinct phases, each of which will build upon the former. This program was designed so that each phase can be replicated – we want everybody to try join our Nourish community so that our impact is felt beyond Columbus. Our design partners: A&R Creative Group and Chocolate Café. Want to Invest in Nourish? Contact Us if you are interested in more information!